When a pipe is damaged and leaking in plain sight, it can be a pretty straight forward repair process. It is much more difficult identifying the location of a leaking pipe under a slab, inside of a wall, or in a ceiling. Small leaks may take weeks, months, or years to be noticeable. By then you may have substantial structural damage or mold growth. Unfortunately, prolonged, undetected leaks may also result in structural failure, so it makes sense to identify possible water leaks as soon as possible, so you can make the necessary repairs in a timely fashion. We are experienced property inspectors who regularly undertake building assessments to ascertain variables such as indoor air quality or the condition of household systems. When we take on water leak detection, we can check for pressurized plumbing leaks as well as structural leaks. With structural leaks our inspectors look at roofs, exterior walls, flashing, windows, and other locations to see if leak are present. We bring with us over thirty thousand dollars worth of leak detection equipment from the best manufacturers around the word to maximize the possibility of accurate detection in your home or business. Have You Noticed Symptoms of a Leak? A damp or musty smell, visible mold growth, a moisture patch on your ceiling or wall, or an increased water bill can all indicate that you may have a leak somewhere in your property. Our inspectors will work hard to track it down for you, so you can get the problem sorted out as soon as possible and avoid continued damage which could be extremely pricey to repair. Our company has been around for a decade providing high quality services, including leak detection, to business and residential properties in and around Orlando. Because we are inspectors only (we don’t perform remediation or repair work) our services are objective and unbiased. Our team can provide the information you need to identify leaks in your home or business and deal with them effectively. To schedule an appointment or find out more about how we can help, you can call us at (407) 721-0594. FSG specializes in the detection of pressurized plumbing pipe leaks and structural leaks. Pressurized plumbing pipe leaks originate from supply lines that feed plumbing fixtures. Infrared thermography (commonly called infrared imaging or thermal imaging) is an advanced, non-invasive technology that allows the inspector to identify deficiencies in buildings that can’t be revealed using conventional visual inspection methods. Thermographic cameras detect radiation in the long-infrared range of the electromagnetic spectrum and produce images of that radiation. The amount of radiation emitted by an object, called “Emissivity”, increases with temperature; therefore, thermography allows for variations in temperature to be identified. Water from hot or cold water plumbing leaks can change the temperature of building materials, which can help the technician find possible leaks. Moisture meters complement thermal imaging to identify if building materials are wet. Moisture meters fall into two categories: Pin and Pinless. Pin moisture meters utilize the principle of electrical resistance. Building materials, such as wood, drywall or other hygroscopic materials complete a circuit between two pin electrodes. The electrical resistance is measured. Moisture content is estimated based on the material being tested. Pin moisture meters penetrate into the substance that they are testing, which leaves small holes the size of pin probes. Pinless meters use radio frequency signals to penetrate the material being tested. Moisture content is estimated based on the material being tested. There is no pin intrusion into the surface of the material being tested. Pinless moisture meter readings are preferred since they do not damage surfaces. Acoustic water leak detection is a non-intrusive method of “listening” for water leak sounds, originating from underground or in-wall pressurized pipes, with the use of specialized acoustic equipment. There are analog and digital systems available. 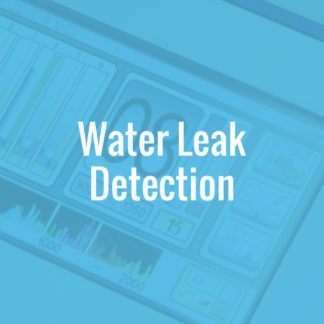 FSG uses computerized digital systems with intelligent algorithms to identify the locations with the most probability of a leak. Acoustic leak detection is normally started by listening to a plumbing system with water. Introducing compressed air can complement standard acoustic leak detection by allowing for some pipe leaks to sound loud or sound more distinguishable from other sounds, which can aid in the identification of pipe leaks. Water is shut off to the building and compressed air is pumped into the system at a pressure that is less than normal municipal or well water pressure. By doing so, the plumbing system is not at risk of damage. There are other instances when compressed air may be used as a primary way to find a leak with an acoustic leak detector. There are limitations to acoustic leak detection. 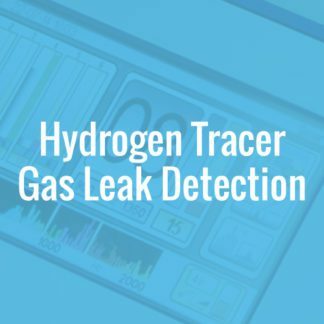 If a water pipe is not under pressure, the leak is too deep for acoustic leak detection, the area is too noisy for acoustic listening devices, or the noise from the leak cannot easily be heard then hydrogen tracer gas can be a very useful technique to locate water leaks. Hydrogen penetrates the majority of building materials. Many materials that are thought to be solid (including concrete, tarmac, block, dirt, mud, gravel, snow, asphalt, grout, tile, wood flooring, etc.) can be porous. A 5% Hydrogen 95% Nitrogen Tracer gas mix is introduced into the plumbing pipe from a cylinder of gas. It will exit at a leak point and make its way to the surface where it can be detected by a computerized Hydrogen sensor.